Oysters and Pearls is one of the French Laundry most famous dishes that is permanently on their daily menu. So if you have been to the French Laundry than I am sure that this dish was the 1st main dish on the menu. Oysters and Pearls dish is made with a sabayon (sabayon is made by beating egg yolks with a liquid over simmering water until thickened and increased in volume) of Pearl Tapioca with Oysters and Caviar. 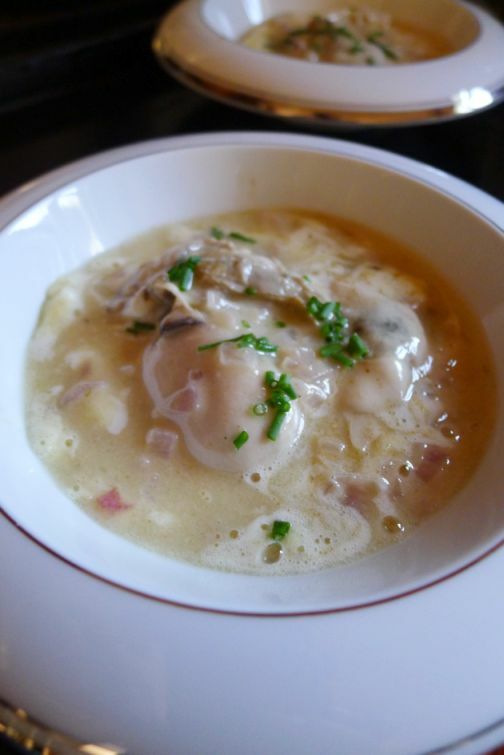 This dish is incredible rich so it is best to serve it with Malpeque oysters (thin and small). Unfortunately in my area the oysters that are available are huge, thick, and creamy but I went ahead and bought them and cut them into thirds or fourth. 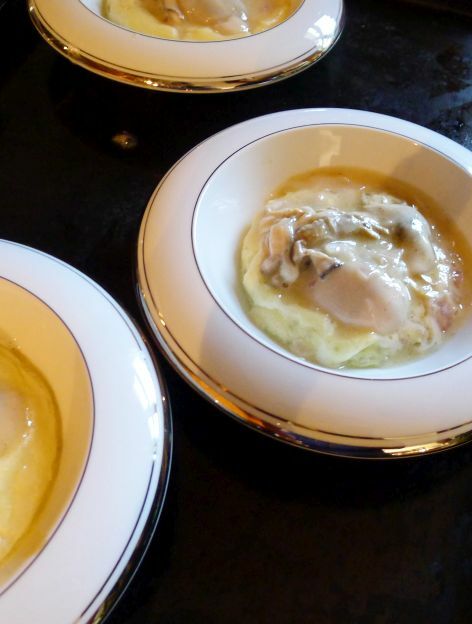 Served on a bed of warm creamy sabayon with large pearl tapioca and a layer of buttery hollandaise-like sauce (beurre monté) with succulent oysters. 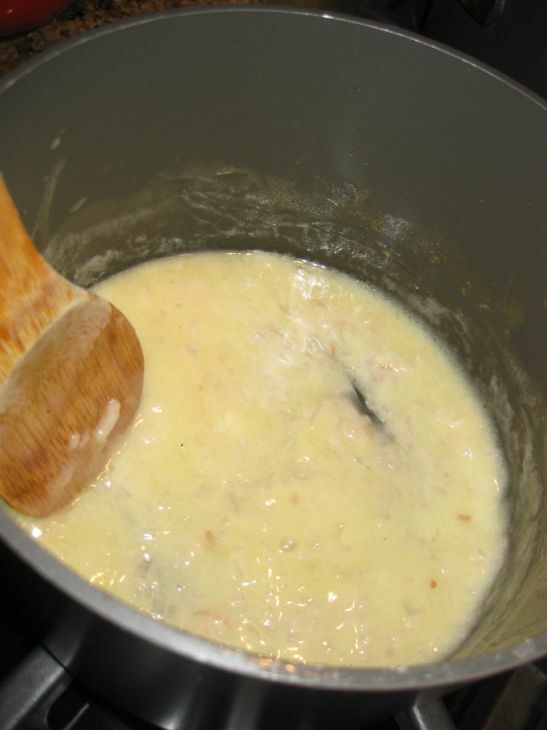 Very rich dish so serve it in small quantity like a generous tablespoon per serving. I planned to serve this dish at my French Laundry at home dinner party for my friend's birthday but I wanted to do a dry runs first with Hoa and Kevin as testers. Hoa, Kevin, and I loved the taste of the dish but we all agreed that I had to cut down the portion at least by half. 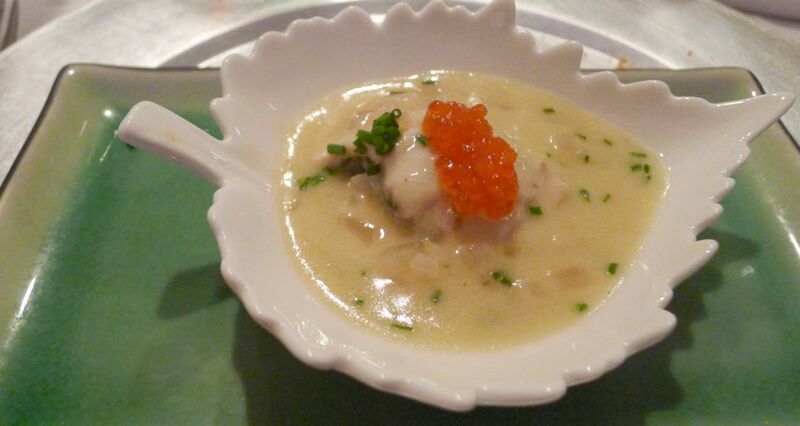 I added a spoon of red caviar and here is how the dish looks like when it was served at my dinner party. 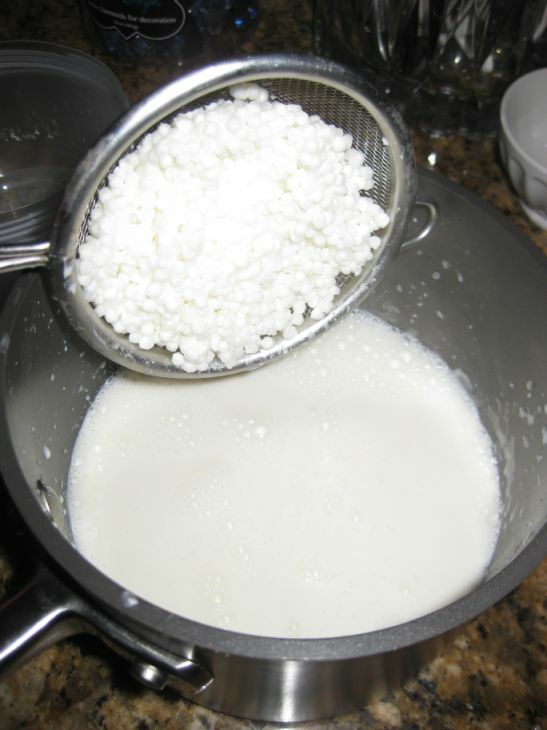 Soak the tapioca in 1 cup of the milk for 1 hour. Setting in a warm place will speed up the re-hydration of the pearls. 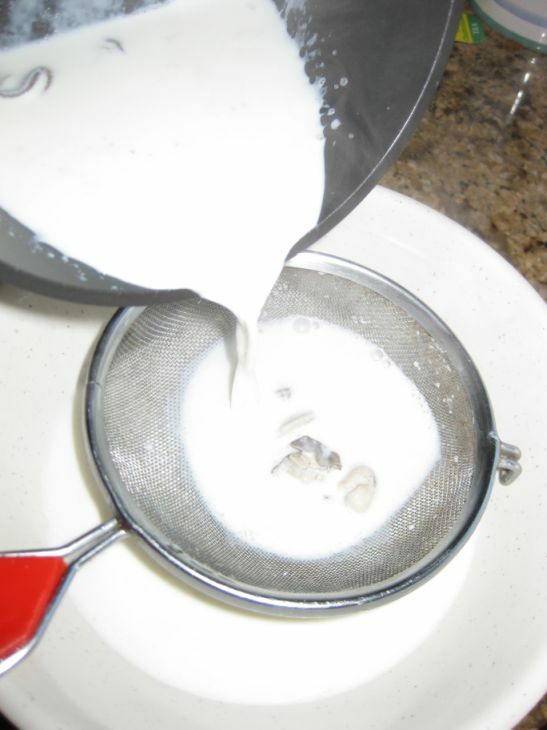 Drain the softened tapioca in a strainer and discard the milk. 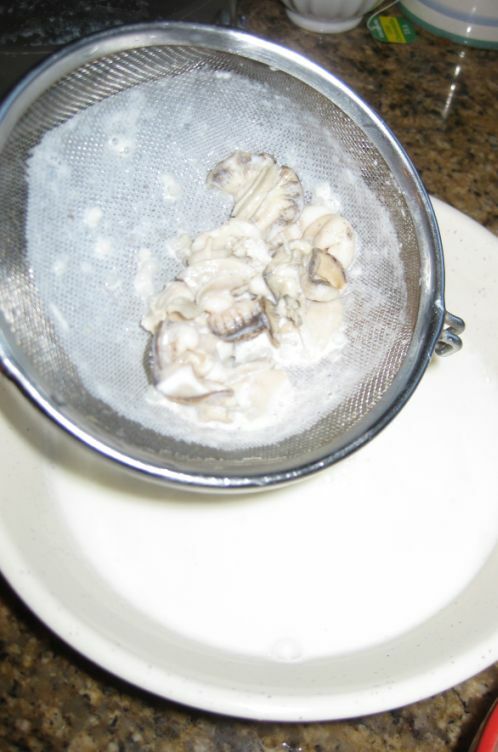 Shuck the oysters (save their juices in a separate bowl). 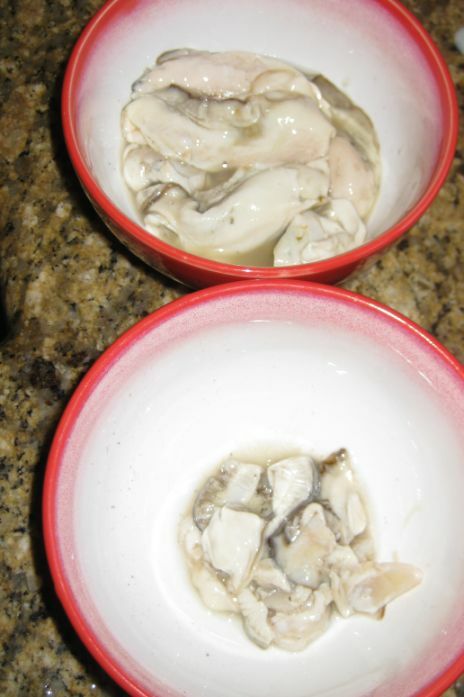 Trim away the muscle and the outer ruffled edge of each oyster and place the trimmings in a separate bowl. 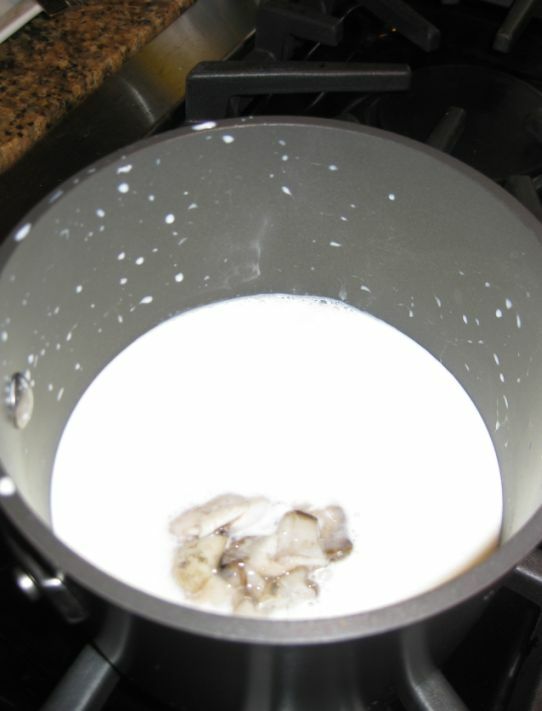 Pour the remaining 3/4 cup of milk and 3/4 cup of cream over the oysters trimmings. Bring to a simmer and then strain. Press down gently on the oysters trimming to extract all the flavors and discard the trimmings. 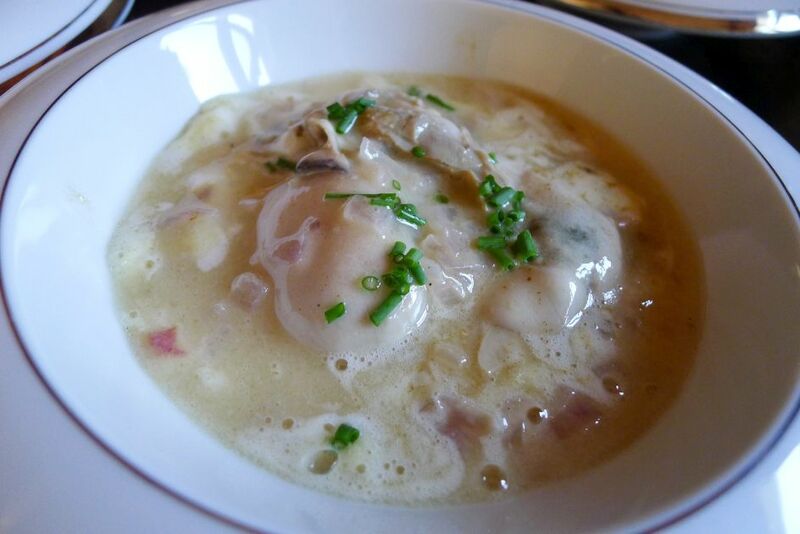 Pour the milk and cream infused oysters flavor back into a sauce pan and add the tapioca. 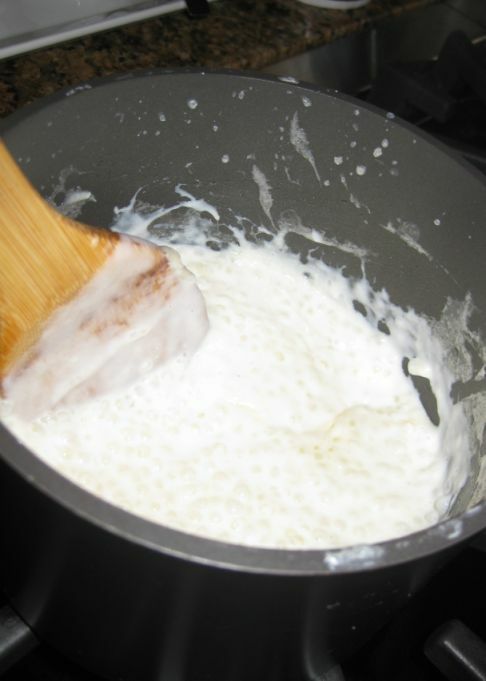 Cook the tapioca over medium heat, stirring constantly with a wooden spoon, until it has thickened and the spoon leaves a trail when it is pulled through. About 7 to 8 minutes. 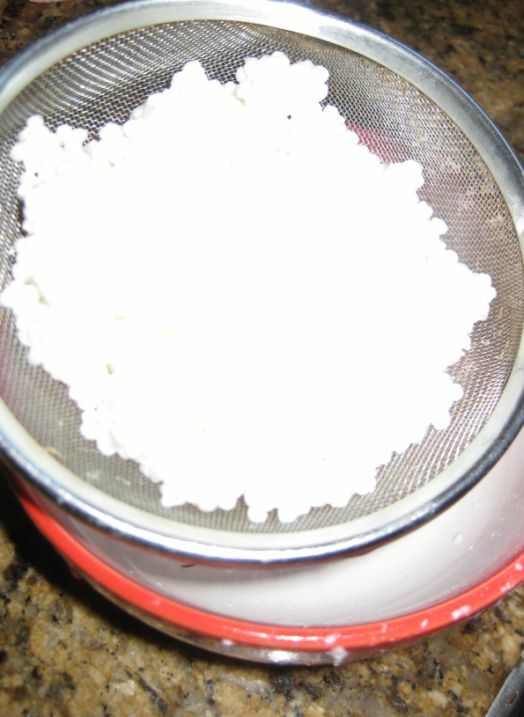 Continue to cook for another 5 to 7 minutes, until the tapioca has not resistance in the center and is translucent. The mixture will be sticky. Put saucepan in a warm place. Make the sabayon. 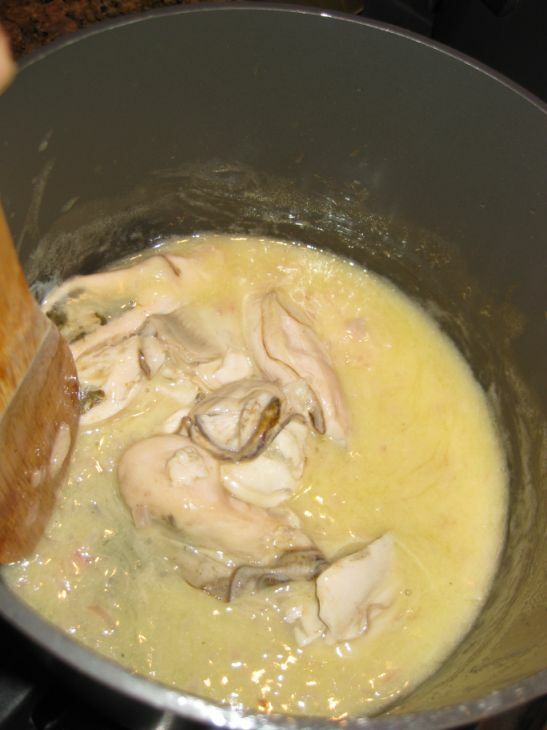 Place the egg yolks and 1/4 cup of oyster juice in the a metal bowl set over a pan of hot water. 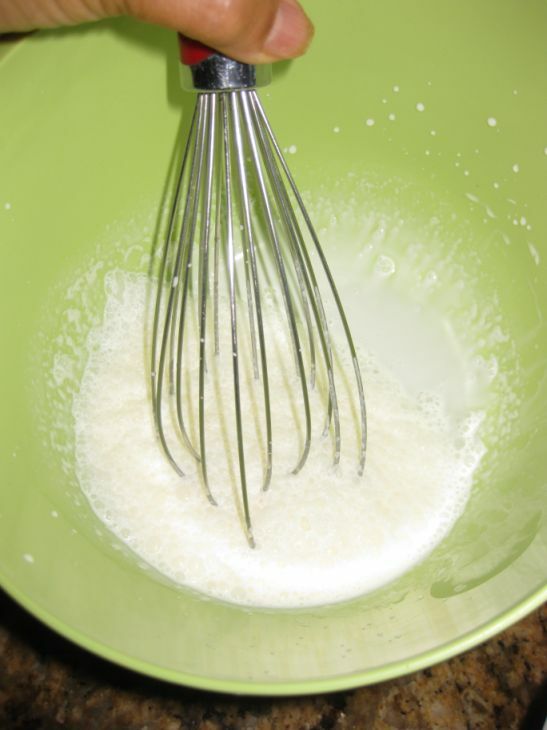 whisk vigorously over medium heat for 2 to 3 minutes to incorporate as much air as possible. 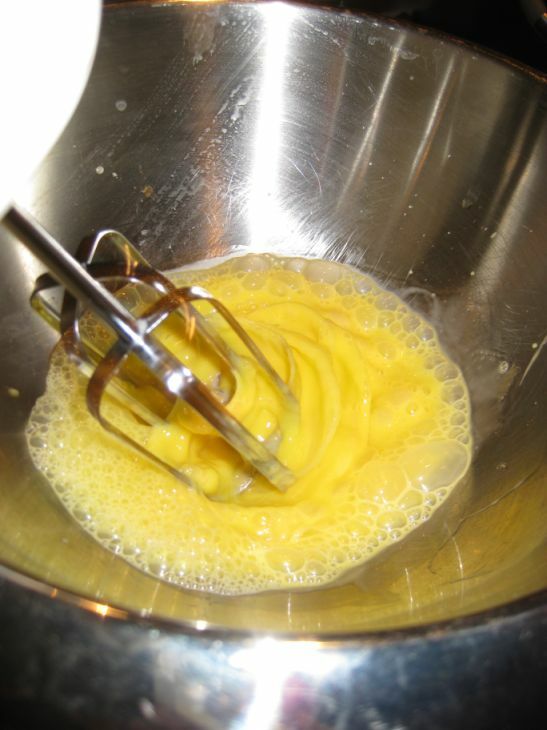 The finished sabayon will have thickened and lightened, the foam will subsided, and the sabayon will hold a ribbon when it falls from the whisk. 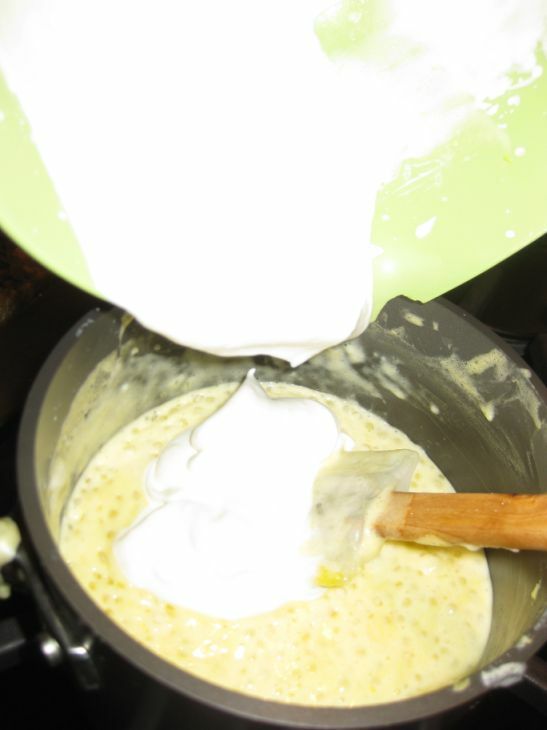 Stir the hot sabayon into the tapioca along with a generous amount of black pepper. Mix in the crème fraiche. 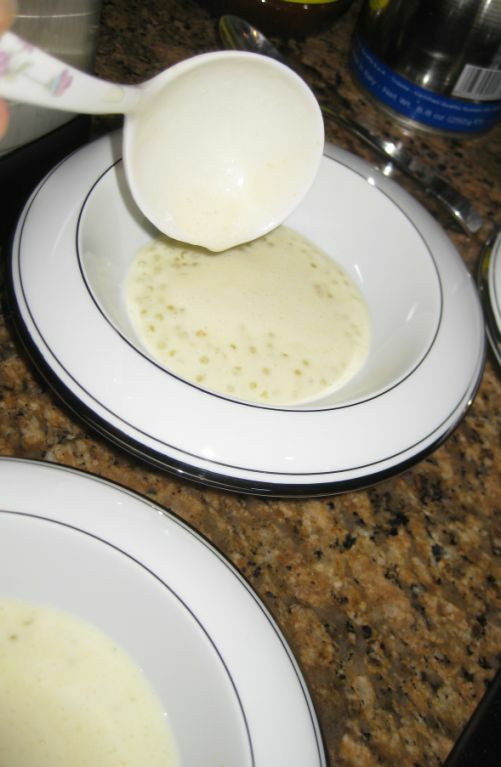 The tapioca will be a creamy pale yellow with the tapioca pearls suspended in the mixture. season with salt. 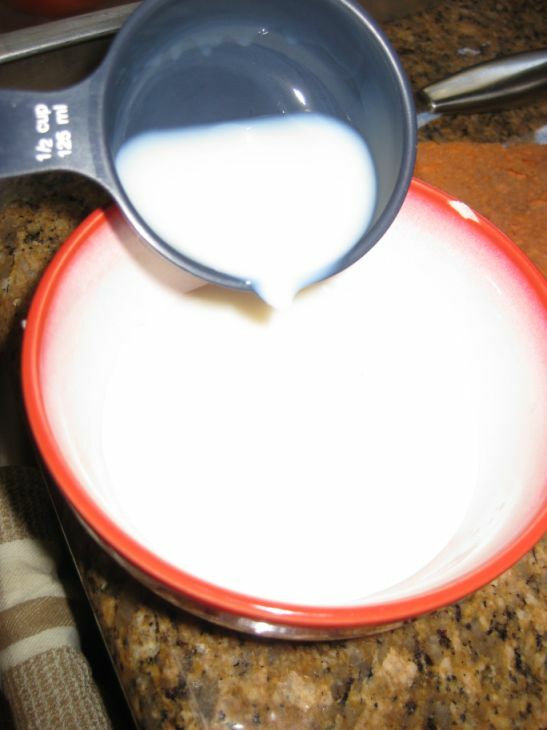 Whip 1/2 cup of the cream just until it holds it shape its shape. Mix in the whipped cream. Spoon the mixture into each of the gratin dish. Preheat the oven to 350 Degrees and place the dish in the oven for about 4 to 5 minutes while preparing the sauce. 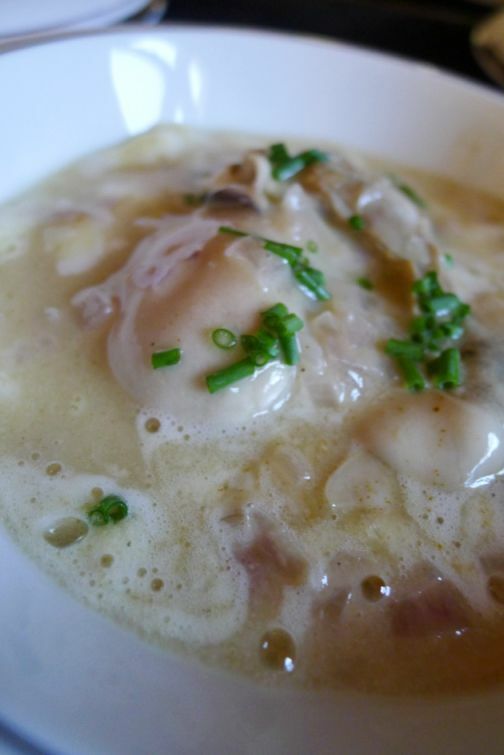 Combine the vermouth, the remaining reserved oyster juice, the shallots, and vinegar in a small sauce pan. 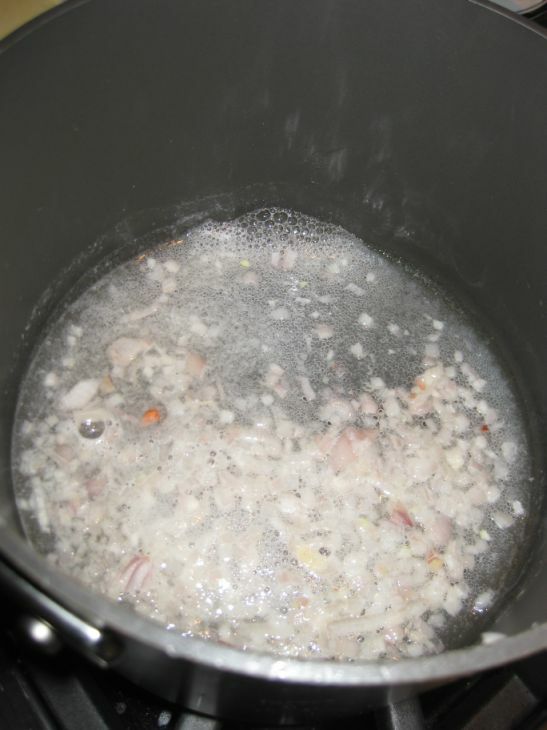 Bring to a simmer and simmer until most of the liquid has evaporated but the shallots are glazed and not dry..
Whisk in the butter piece by piece, adding a new piece only when the previous one is almost incorporated. 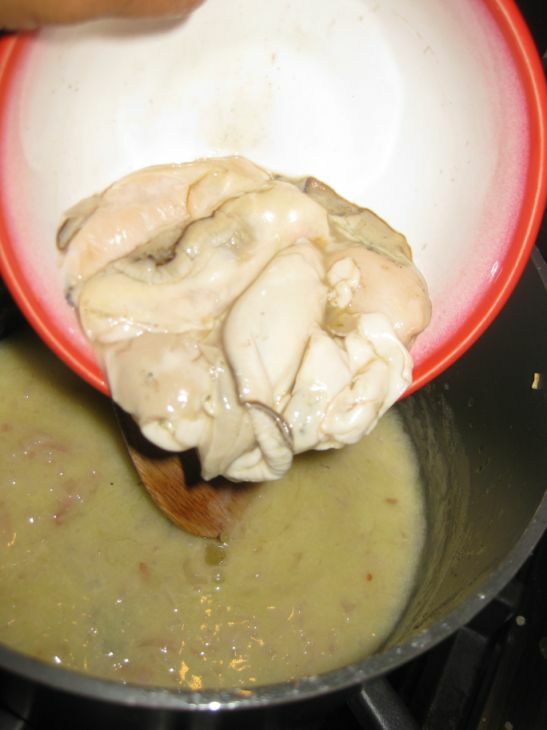 Add the oysters to the sauce. Stir for 30 seconds just enough for the oysters to warm up and turn off the heat. 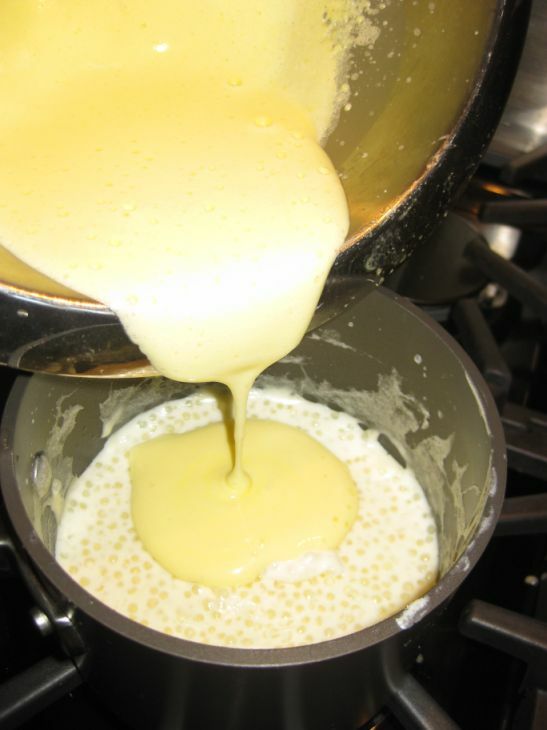 Remove the gratin dish from the oven and spoon the sauce on top of the pearl sabayon base. Add chives and serve.